Now you can have your steak and eat it too! Product: Blackstone Grill Box - 1060 Outdoor Cooking Accessory for the 1050 Commercial Griddle. This Blackstone accessory makes it possible to change your Blackstone Commercial Griddle into a large grill, allowing you to cook breakfast on the griddle in the morning and later grill hamburgers and steaks for lunch or dinner. The Griddle is easily removed from the existing stand and the Grill Box can be put in place and in no time you can enjoy a fresh grilled meal. Height to top of trolley 31.75"
Height to top of griddle: 36"
This Blackstone Grill top model 1060 is being changed to model 1514. If you receive your order for the 1060 and arrives as a 1514, the two models are the exact same product. Blackstone Grill Box Accessory does not include the Blackstone Griddle or its stand. 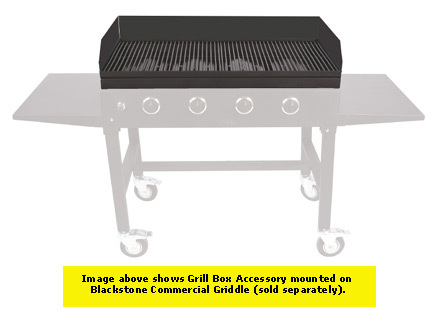 Competitive Edge Products, Inc. is an authorized retailer of the Blackstone Commercial Griddle and Grill Box Accessory. Check out our other camping equipment andpicnic tables! Received as promised. Good sellers. Excellent communications. Dimensions: 37" x 21" x 6"